Website created to reflect the spirit of parties and focusing 100% to kids parties and all you can ever need to make the best party of all times, the web design was done completely from scratch following the clients specifications of having a site colorful and user-friendly. 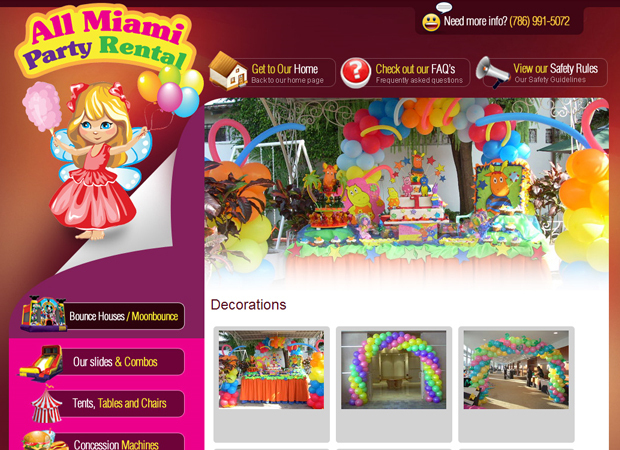 All Miami Party Rental is a full-service party rental company dedicated to personalizing your event with high-quality supplies and friendly, dependable service. Their website was created from scratch placing special attention on kids; all their services and products are displayed in an array of different ways to make it dynamic and very colorful. This website also has a back-end administration platform created especially for this website where administrators and webmasters can make changes on the site any time they need. Features like images upload, galleries creation, pages edition and blog management are fully integration within the admin area for a very easy and user-friendly access.